News | | Published: 09:28, Thursday November 8th, 2018. Hundreds of campaigners marched through Blackwood in protest against council plans to close leisure centres. The march, which was held on the 179th anniversary of the Chartist uprising, was joined by former Labour leader and Islwyn MP Lord Neil Kinnock who addressed the crowd. Caerphilly County Borough Council wants to maintain four “strategic” leisure centres in Caerphilly town, Risca, Newbridge and in Aberbargoed or Bargoed to service the entire borough. Leisure centres in Cefn Fforest, Pontllanfraith, New Tredegar and Sue Noakes face the greatest risk of closure as local schools would be unable to assume management of the sites. A petition against the strategy has drawn around 5,500 signatures and there is cross-party opposition to the plans. Campaigners were joined on the November 4 march by former Labour leader and MP for Islwyn Lord Kinnock, former Islwyn MP Lord Don Touhig and the current Islwyn Labour MP Chris Evans. Neil Kinnock from Sian Jones on Vimeo. Addressing campaigners, Lord Kinnock said: “When the Chartists marched down this valley to Newport, they were met by dragoons who killed 19 of them. “The reason why the men and women of this valley then, without any rights, were prepared to sacrifice their lives and their livings were in order to get their voice heard – to be listened to. “They believed in the advance of democracy – the right of ordinary people, powerless people, to exercise control over their lives. 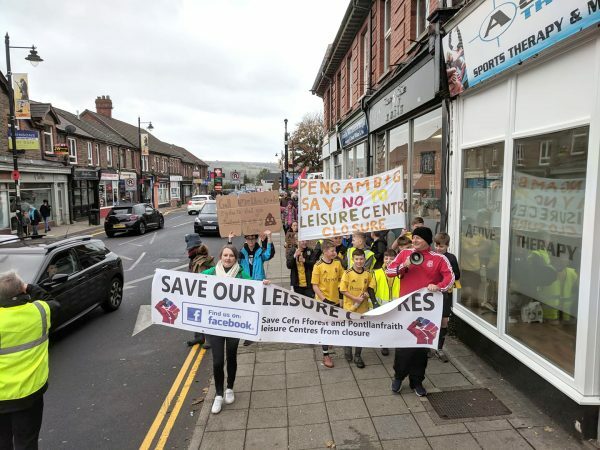 Labour’s council leader Dave Poole had earlier angered residents wanting to save the leisure centres by stating that marching through Blackwood wasn’t “the answer”. A new council report into the plans has claimed a ten-week consultation has shown “broad support” for the strategy which would see the council invest in four “high class strategic multi-functional facilities”. Out of 711 completed surveys, 52% said that ‘rationalising’ leisure centres would have a negative impact. The report also reveals that interest has been expressed by a third-party in taking over the management of Cefn Fforest Leisure Centre. The council’s regeneration and environment scrutiny committee is due to discuss the outcome of the consultation at a meeting on Thursday, November 8, and will make any recommendations to the council’s cabinet.